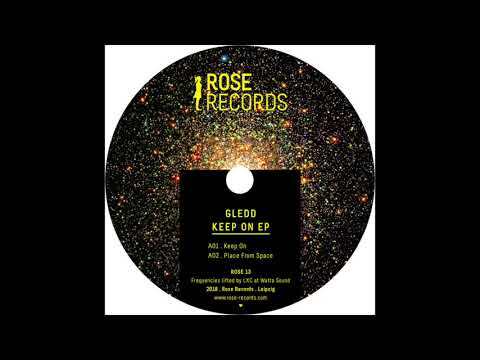 Leipzig based Rose Records is excited to announce add Gledd to their impressive roster with the Keep On EP. The Italian producer’s first release includes two tracks on a split EP with Chassé on Rose 12/13. Gledd’s tracks take hold of the listener with the instant introduction of an infectious groove. The vinyl worn drums bleed into a deep reverb as the sequence progresses to warm up the floor on “Keep On.” The funky guitar riff plays a call and response to the dreamy chords on the keyboard, buzzing in and out of the groove of the drums as vocal samples are introduced throughout. The arpeggio introduced at the midway point appropriately has hints of some Italo-disco influences. The bassline breathes with the Moodymann style of choppy disco edits while the drum breaks maintain the classic feel and warmth throughout. “Place from Space” develops this Detroit style with background chatter sample and quick vocal hits closing out sequences to introduce new flavors. With strings and horns complimenting funky riffs and sustained disco keyboard melodies the groove rolls on and on and on. Suitable for that moment that the night turns from disco to deep house or even a sunset set, “Place from Space” plays seamlessly in any room ready to get down. Rose 12/13 will be the first “real” split EP on Rose Records and also features two new additions to their label. The 12” will be available on 180g vinyl via the Rose Records Bandcamp on June 22nd.